Chiropractors deserve options. Electronic health record software should be inexpensive, easy to set up, and easy to learn. BackChart® provides the most reliable, affordable, user-friendly, and patient-centered electronic health record software on the market. 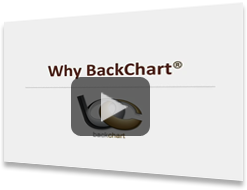 BackChart®’s web-based software helps you access your patient information any time & anywhere. Simply open an internet browser and login from your desired platform (Mac or PC). Instead of investing thousands of dollars into maintaining personal servers, we are able to provide you access to our quick and dependable servers. All data is secure & automatically backed up. BackChart® has secure systems in place that protect all your patient data. We constantly back up all of your information. Unlike traditional software, you do not pay for upgrades with BackChart®. We take your feedback and provide free updates that are packed with new features helping you provide better patient care.